For some of our Clients they prefer to interact with us online only. Check out our video for more information. 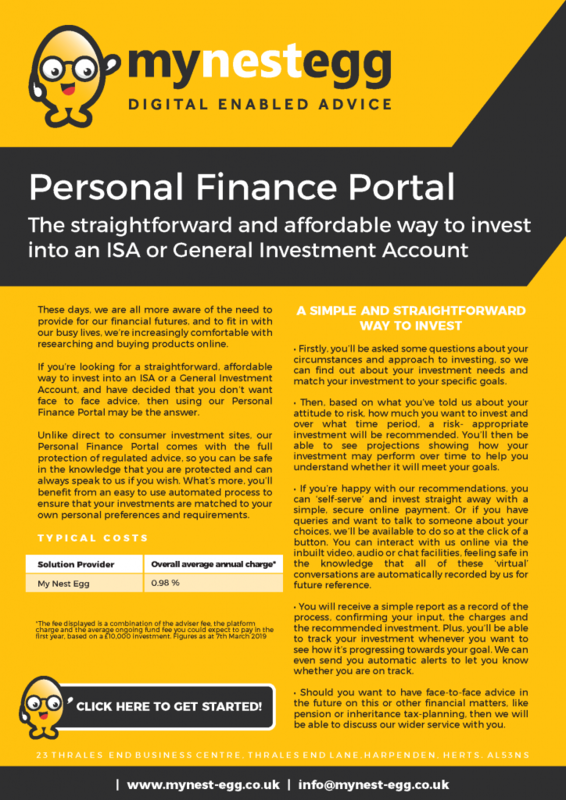 That’s why we’ve introduced My Nest Egg, our new digital enabled advice channel via our Personal Finance Portal (PFP), a revolutionary new platform that enables you to apply and set-up your Individual Saving Account (ISAs) and General Investment Accounts (GIAs), all online and at the touch of a button. My Nest Egg is a trading style of PP Wealth Ltd, which is authorised and regulated by the Financial Conduct Authority. This Automated Advice service is provided on a ‘Restricted’ basis meaning that it is restricted to Individual Savings Accounts (ISAs) and General Investment Accounts (GIAs). They are provided by AEGON using our recommended Investment Provider, Vanguard. It is provided for people who wish to ‘self-serve’ and who have decided that they do not want a full advice service. You benefit from access to quality financial planning solutions with a competitive fee charging structure to maximise your value for money. If at any time you want to step off from interacting online only and talk to one of our qualified financial planners (subject to hourly fee charging), then PP Wealth are here to help.